I follow a wonderful business blogger and coach, Christine Kane, that encourages people to pick a WOTY every year for themselves. And you're like "What's a WOTY??" It stands for Word of the Year. And yes, I realize it's already April, but work with me here. I've had some good ones over the past few years (Commit, Growth, Intention). But this year I chose Foundation. And you getting this newsletter in April instead of January has a little bit to do with why that is my word this year. Let me tell you. Actually, let me promise you, that stuff will happen. LIFE will happen. Small stuff, sure. But you will inevitably have something big happen as well. And when you do. You better have a strong foundation to stand on. One day your health (or your loved one's) could be put to the test from an injury or an illness. If you have a strong healthy foundation to begin with, you'll be a lot better off. Imagine a major repair needing to take place on your home or car. You better have that financial foundation built (i.e. money saved) so it doesn't put you into debt taking care of it. What if that day comes that you get your heart broken and someone you love lets you down. You need a solid emotional foundation to deal with it.. instead of it dealing with you. As you can bet, my Foundation is in Christ. But I like to take care of the other "foundations" in my life so I can handle what comes my family's way. My husband had a mountain biking accident on January 6th. The crash itself wasn't that bad (seemingly anyway), but it resulted in very serious medical complications. I am positive that if he hadn't been as strong and healthy as he was going into it, he might not have come out of it as well as he did. Not to mention having things in place where we weren't going to financially implode during his 26 days in the hospital. We had incredible support from our foundation of family and friends. And without a doubt, our foundation in Christ got us through the scariest parts of it. 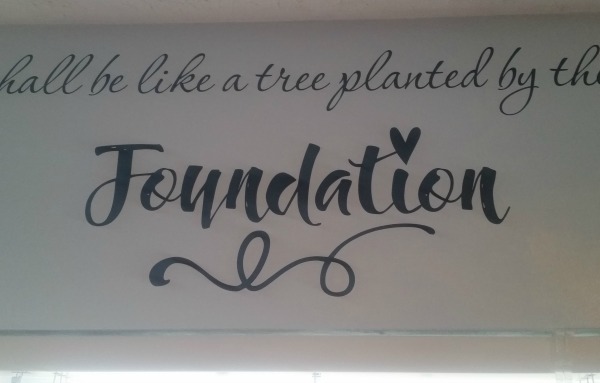 So the word on my wall that I get to see and reflect on every single day is.. Foundation. I can honestly say that it is THE perfect choice of word for my (our) year. We've comprised a list of 45 different words. Most likely, one will speak to you more than the others. There are also 21 fonts. You pick one word in any one font and we'll size it to 4" tall (that's overall height from the bottom of a g or y... and to the top of a k, l or b. They are all the same price, and Shipping is still FREE (we're awesome that way). Here's to an amazing rest of the year :) Create something beautiful today!